Nikon was the first major camera manufacturer to introduce a compact camera powered by the Android operating system, announcing it shortly before Samsung revealed its Galaxy Camera. 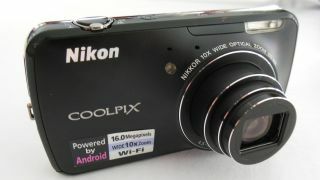 To complement this, the Nikon Coolpix S800c also features integrated Wi-Fi, which enables apps to be downloaded, and emails/images to be sent. If you're not in a Wi-Fi hotspot, you can also tether the camera to your smartphone to take advantage of 3G signals. Read: Are photographers finally ready for Wi-Fi? Anyone familiar with using an Android smartphone or tablet will be at home with using the Android section of the camera. It's reached via a touchscreen at the back of the camera, where there's also access to the Google Play store to download any of the current Android apps. This includes apps such as Skype, Instagram and Facebook. Packed onboard the Nikon S800c is a 10x optical zoom lens, Full HD video recording and 1.7GB of internal memory - which can be used either for apps or for storing pictures and videos. The Nikon Coolpix S800c price will be £379.99 in the UK and $349.95 in the US, and it will be available to buy from September 2012. With the Nikon S800c running Android, you can install popular apps, such as Instagram, and use them on this compact camera just as you would on a smartphone. The interface is pretty much identical to smartphones and tablets running Android. A full range of apps are available to download via the Google Play store. The S800c features a 10x optical zoom lens, making it versatile for travellers.